These cupcakes are probably the girliest, cutest, prettiest cupcakes I have ever made. They are perfect for Valentine's Day, for a dinner party with friends, for a girl's night get together, or for making with a little girl. I decided to make these for the ending to a seven course dinner party with good friends who were visiting from Toronto, and my Mom, visiting from Rochester. Despite the professional appearance of the cupcakes, they are actually not that difficult to make, as long as you have an artisan mixer and the right gel food colorings. I have long loved red velvet cupcakes. They have just enough chocolate in them (a couple of Tablespons in the batter) to have a light chocolate flavor to them, but they are not an overpowering death by chocolate cupcake. 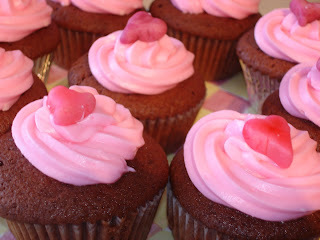 Although I developed my own recipe for the frosting, I used one of Martha Stewart's recipes for the red velvet cupcake. There's only so many ways one could make a red velvet cupcake, but what I like about this recipe is that the batter does not use any butter - only canola oil, which makes it a tad bit healthier - I suppose. 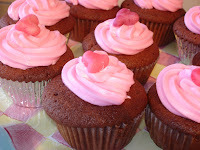 The red velvet hue from the red velvet cupcakes, or in a red velvet cake, comes in part from the chocolate powder, but also from the red food coloring in the cupcakes. One thing you should be sure to buy to make these cupcakes with top-notch results is some professional grade gel food colorings - this is such a good investment if you plan to do a considerable amount of baking - I got 12 colors for about $10-15 from New York Cake. Here is Martha Stewart's original red velvet cupcake recipe, which was my starting point, and below is the recipe I used, with some slight modifications. Preheat the oven to 350 F. First to prepare the cupcakes, mix the flour, salt, cocoa powder in a large bowl. Beat the sugar and oil in your artisan mixer until well combined, addding the eggs one at a time, and continuing to beat. Mix in the gel food coloring and the vanilla extract. Turn the artisan mixer to low speed, and add the flour and the buttermilk, alternating between additions of each. Mix well. In a small bowl, mix the baking soda and the vinegar (it will fizz, just like those volcanos you made as a kid). Add to the batter and mix for about ten seconds. Line two silicon cupcake trays with cupcake liners and put the batter in the liners to fill about three quarters full (my husband, Brad, always does this part because he is very neat at doing this without dripping cupcake batter everywhere). Bake at 350 for about 20-25 minutes until it passes the fork/toothpick test. Try not to open the oven during the baking process if you can help it, as they will rise better if you don't open it until the end. To make the frosting, beat the cream cheese and butter at high speed in the artisan mixer for a couple of minutes. Beat in the powdered sugar (you should put the plastic sides up on the mixer so it doesn't make a powdery mess). Add a drop or two of the pink food coloring and keep mixing at high speed until the frosting has a nice consistency - a few minutes at least. To make the decorations on top, buy some marzipan and mold hearts. 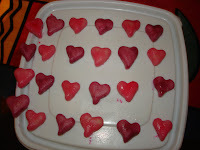 I used an unused watercolor paintbrush to paint the hearts with some lightly diluted food coloring and let them dry . 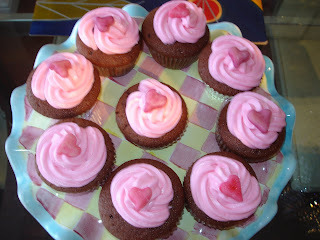 Wait at least an hour or two to frost the cupcakes - they must cool off completely or you will melt the frosting. To get the professional look, I used a frosting bag fitted with a fluted tip. When you squeeze the bag to push out the icing, do so in a circular manner to frost the cupcake the way i did. The result is a pretty, professional look. 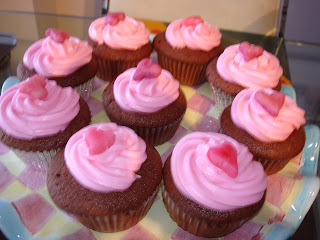 Top the cupcakes with the marzipan hearts. These cupcakes taste as good as they look. The recipe makes abotu 24 cupcakes (we made 22), but feel free to cut the recipe in half if you want a smaller batch. Our house is filled with cupcakes - everywhere you look there's a cupcake.